The first Accelerant Detection Canine ever in the United States was introduced to the fire service on May 1, 1986 by the Connecticut State Police. An accelerant detection canine (arson dog) is a dog that has been specially trained to sniff out evidence that may have been used to start a fire. These dogs go through extensive training before becoming a certified accelerants detection canine. Each dog is a part of a team that is comprised of the canine and its handler. 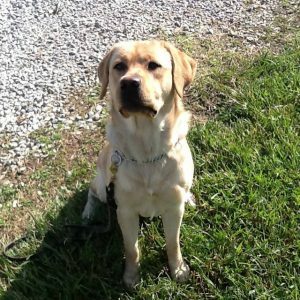 A wide variety of dog breeds are used as arson dogs, although Labradors are especially common. At the end of training, an arson dog has learned to signal her handler about the presence of traces of accelerants. The dogs "primary alert" when they find the presence of an accelerant is to sit. A secondary alert is when the dog changes its attitude; salvation, excitement and attempts at eye contact with the handler. The dogs are able to detect trace amounts of accelerants; amounts that machines cannot even detect. The dogs are able to find accelerants easily, however, the laboratory does the research. Dogs have famously good noses, and an arson dog is capable of detecting trace amounts of materials which would be almost impossible to find using other means; these dogs can literally find the needle in the haystack which could prove that a fire was deliberately set. They are also subjected to regular training to ensure that their senses are still sharp. It is important to remember the dog is not the final judge that decides whether a person goes to jail for starting a fire or arson. The dog is only a tool to help fire investigators find the presence of an accelerant. Today there are over 200 accelerant detection canine teams working in the United States. Each year billions of dollars worth of property damage and hundreds of lives are lost due to the crime of arson. This crime has an impact on all communities and this resource can help fight this crime.